Unsplash, a popular free photo download service, has recently, and controversially to some sectors in the Internet community, changed their licensing terms, going from a Creative Commons Zero (CC0) license to a custom made “Unsplash License”. 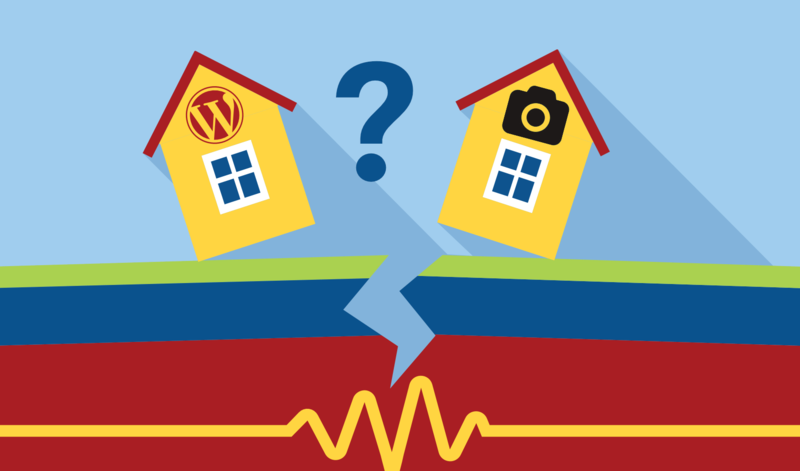 Such a modification has raised up questions around the web and within the WordPress community. “How can these photos be used from now on?” and “Will Unsplash remain a reliable source for free photos?” are two of the main ones, which will be answered in this article. WordPressPublisher: Can I still use Unsplash photos for the content I create and publish? WordPress Theme Creator: Can I use Unsplash photos in WordPress themes with the new license terms? To get the answers it’s necessary to know the whole issue. First things first, let’s briefly talk about what Unsplash is. As said above, Unsplash is a very popular free photo service that started as a side project by freelance designing platform Crew. Initially sharing leftover images from a custom photo shoot and later accepting submissions from photographers, all images on Unsplash were under a Creative Commons Zero license that granted high flexibility in usage. What sets Unsplash aside from the rest is one, and huge, difference in the business model. While most free photo services monetize their traffic through affiliation with big stock photo agencies (of the likes of Shutterstock and similar), Unsplash’s core goal is to redirect traffic and customers to their main designing business, while also serving to build up photographers’ reputation and individual photography businesses. Judging from this 2014 article, we understand that the hosting costs for their now 200,000+ photo collection are more than compensated by the traffic generated for their Crew business. Now you are clear on what Unsplash does and why they do it, let’s have a look at how and when you can use Unsplash photos in your WordPress site (or any other website, for the matter). A content creator (photographer) can waive the main usage and other related or neighbouring rights he/she has over his/her work when using a CC0 license, but cannot clear rights that belong to third parties involved in the creation of the images. A publisher can use a CC0 image in their publication without having to credit the author or supplier, and are at the same time allowed to edit and alter the image as much as they like. However, the challenge rises from he or she being unable to ever know if the content creator/photographer who uploaded an image under CC0, Public Domain or other similar free usage license, is aware of said license’s terms and limitations. You see, the photo itself is the intellectual property of the person who created it, but photos often depict people and private properties. What happens with these subjects’ rights? As you probably guessed, they belong to each subject. Only the people depicted on the pictures, or the owners of the private property included in it, can give permission for their likeness or property to be used commercially, or even editorially. Basically, Unsplash is telling you that before using any of their photos you need to be knowledgeable on how you are allowed to use them for commercial or editorial purposes according to your jurisdiction’s laws. From our point of view, this terms also imply you must trust that every photographer uploading photos to Unsplash is aware of what they are uploading and how it can be used. Now, sharing a photo that you own for others to use for free, even one that includes copyrighted elements, is one thing. Using a free photo as end-user in a determined project, is a different story. Any final responsibility for image misuse or copyright infringement lies with the end user or publisher. So if you fail to use the photo in a correct and accepted way, it is most likely that it will be you, and not Unsplash nor the photographer, who will end up being sued. How to get out of the hole? In short, all photographers should know their way around image licensing and they should only upload photos with no copyrighted nor trademarked subjects or models, or otherwise upload those for which they know they have all the legal releases in place. For these, but not only these, reasons, a free photo service cannot provide the same level of certainty and reliability for commercial usage (and often for editorial use as well) than a paid photo service. Simply because the economic return from setting up a full image verification process is too small to work with a free photo giveaway model. The license gives permission to use but that doesn't mean usage is always legal. You can have CC0 photos of Apple products and ..
We’ve answered the WordPress Publishers concerns. Now let’s jump to the other matter, that that concerns to theme creators, some of which were loving Unsplash’s broad licensing terms and are now worried about getting into potential trouble with the new license update. So, can you, as a WordPress Theme Creator, use Unsplash photos in WordPress themes under their new license? Thank you for replying but it is not the same. CC0 allows all kinds of redistribution. The unsplash license has no clause against redistributing the individual photos. It's the entire collection of photos that has the .. Yes, the Unsplash License is still compatible. That one restriction you think is so light is not allowed by the wording of the GPL, which is why we're having this conversation. -Not a lawyer: GPL has no limits on distribution. But Unsplash has, so they are not compatible. If you are submitting a theme to https://t.co/mcbEh8GVOZ then everything in the zip file should be GPL compatible. Our Conclusion for WordPress Themes using Unsplash is with Caroline, Emile and Samuel. From a purist GPL point of view, the Unsplash license, different in several points with CC0 license, is not compatible for use in WordPress themes that are covered by GPL. We understand, however, that this is not Unsplash’s intention with their new custom licensing terms. As a theme or plugin developer for the WordPress repository (which are some of the most active members in the WP community) this seems to mean that Unsplash photos can’t be used safely in themes anymore. Contextualizing, intellectual property rights laws in the world are arcane, and the photo world is part of that unpredictable legal environment. This is one of the main reasons we created the PixelRockstar plugin, to provide WordPress publishers with photos that are legally safe, ready to use commercially and forever, without ever having to worry about copyright or trademarks. We even have an Extended license available which covers theme and plugin developers usage, letting them bundle our images with their work and granting rights for redistribution to end customers. Like this, great WordPress themes come to life with lovely images that both end user and publishers can use right away and out-of-the-box. PixelRockstar is a photo service providing legal stability and a productive environment for WordPress users and theme developers, that lets you search through a collection of 4 million professional images ready to be added into your posts in seconds. It saves you time, while enabling you to create awesome content for your audience. Continue reading on this subject!